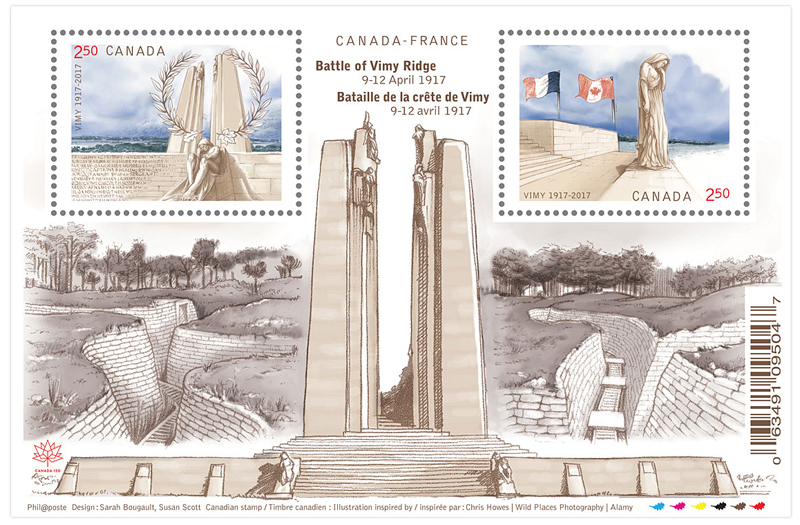 Honour the service and sacrifice of Canadian soldiers with this special joint souvenir sheet commemorating the centenary of the Battle of Vimy Ridge. The significant First World War battle, which began April 9, 1917, marked the first time all four divisions of the Canadian Expeditionary Force had fought alongside one another. Their success in capturing the ridge brought international acclaim to a young nation, and has come to be viewed as a coming of age moment for Canada. Still, the price was steep, with nearly 3,600 Canadian casualties and more than 7,000 wounded over four days of fighting. The souvenir sheet bears two international rate stamps, one designed by Canada Post and the other by France’s La Poste. 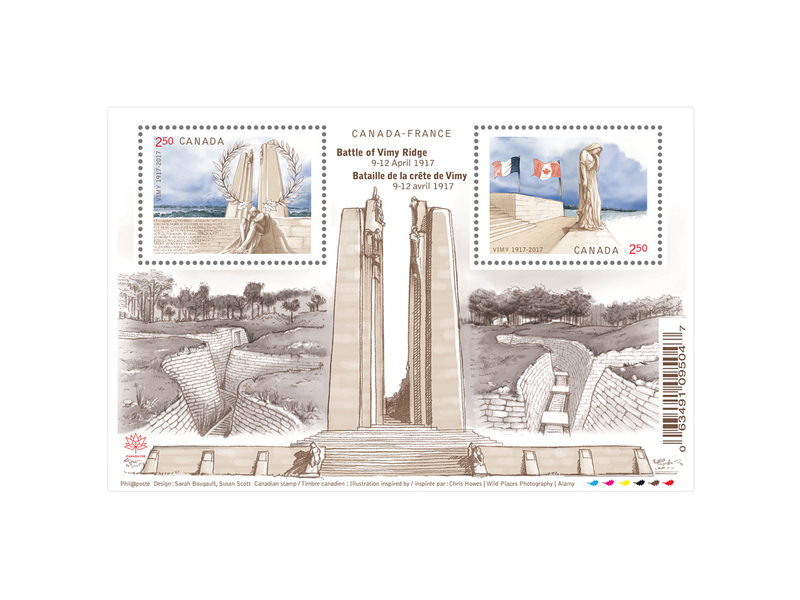 The Canada Post stamp, in the upper left, depicts the twin stone pylons of the Canadian National Vimy Memorial monument surrounded by a pair of laurel sprigs. Seated at the bottom is one of the monument’s two Mourning Parent statues. The French stamp, in the upper right, depicts the monument’s Canada Bereft statue, with the flags of both nations flying proudly in the background. Below the stamps, an illustration of the monument is flanked by images of preserved trenches from the surrounding battlefield. As with all 2017 issues, the souvenir sheet includes references to Canada’s sesquicentennial. The words ‘Canada 150’ are printed in microtype on each stamp, while the sesquicentennial logo appears in red in the lower left corner of the sheet.